The role of myocardial contractile force in the progression of cardiovascular diseases such as heart failure (HF) has been the focus of many studies. 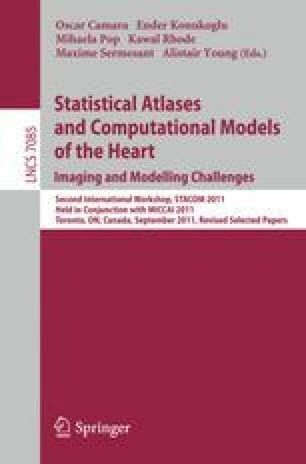 In order to better understand the mechanisms underlying compromised contractility, finite element (FE) modelling of ventricular mechanics is a useful tool. Distributions of active fibre stress during systole were estimated using left ventricular (LV) FE models that incorporated in vivo MRI tagging data and concurrent LV endocardial pressure recordings to parameterise a time-varying model of myocardial contraction. For five canine hearts, the calcium dependent contractile stress increased to peaks ranging from 33 kPa to 57 kPa during systole. Regional distributions of fibre stretch, stress, and myocardial work were examined in each case. Using this type of integrative biophysical modelling to compare normal and pathological cases will elucidate the underlying physiological mechanisms of cardiac mechanical dysfunction.